Make Microsoft's Surface work and play just the way you want it to. Microsoft's Surface tablet has the features and personality you're looking for, with a robust environment for business computing that doesn't skimp on fun. 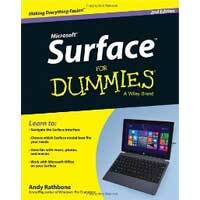 Surface for Dummies, 2nd Edition explains how Windows 8.1 Pro and Windows RT differ, and helps you decide which Surface model is best for you. Step by step, this book walks you through both the hardware and software features of the Surface, including the touch cover and type cover, Windows RT and Windows 8.1 Pro operating systems, and the coveted Office Home & Student 2013 software suite that's bundled with the Surface. Written by bestselling author Andy Rathbone, this easy-to-access book is filled with information on how to use the tablet, figure out the operating system, navigate the app environment, and take advantage of your exciting new Surface.